Having served at Sandals Church in Riverside, California, for ten years during a high growth spurt for the church, his most recent work has been in Atlanta with Andy Stanley’s Buckhead Campus of North Point Ministries. At Buckhead, Carlos served as the Director of Service Programming. 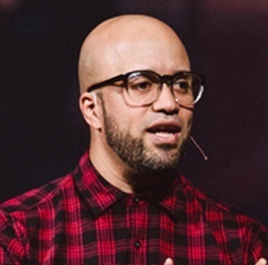 In addition to leading worship, Carlos oversaw all the Sunday adult experience and design, including all areas of Hosting, Production, Creative, Video, Music, and Programming at Buckhead Church. In addition to partnering with VGS, Carlos continues to lead worship at Buckhead, sits on the creative sermon planning team for Andy Stanley, and contributes to the creative planning for Catalyst Conference. He also leads a coaching network of worship and programming, is recording his first CD with Integrity Music, and is in constant demand as a guest artist in some of the world’s most creative and largest churches. He is an artist, pastor, thinker, experience architect, and Web 2.0 junkie… and we welcome him to the Vanderbloemen Search Group team.